Is Dracula Related To Anyone? Does He Have "decendants?" 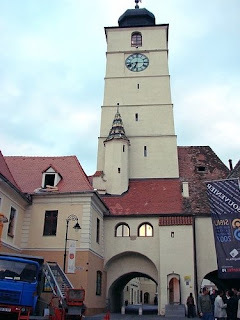 This is Sibiu, which used to be known to the Saxons as Hermannstadt... this has a link to Vlad Tepes, better known to the Western world as the man behind the famous character by Bram Stoker Count Dracula. The thing is that Vlad Tepes had descendants-- his granddaughter lived in Sibui after the murder of her father, Vlad's son. So he did have children and grandchildren. There is also a connection with the British Royal Family and Queen Mary of the United Kingdom, who is a descendent of Vlad Tepes. As for Count Dracula--- he was undead and as far as reading the book by Bram Stoker Dracula-- he did not have descendants. Although he may have had a child.